Earlier this month I got an email from Credit Sesame enticing me to return to their site and see how my credit score has changed. I created an account over three years ago when my wife and I were in the hunt to buy a home and needed a sense of our credit score to get pre-qualified for the loan. However, after we got approved, we’ve had little need to check our score again…until I got the email from Credit Sesame with the subject line “see how your credit score has changed.” The competitive side of me was immediately activated and I logged into Credit Sesame. Fortunately, my score went up….however I do not know why. Beyond the home purchase, my credit activity has been the same as it ever was (Talking Heads anyone?). If anything, the cash component of our financial health has become softer AFTER the purchase. Credit scores don’t measure financial health…only credit worthiness…using a process NO ONE UNDERSTANDS! Beyond affecting the ability to borrow, the credit score has a limited use. We are all engrained in the United States to care about our credit score. We all know our own score (roughly) and understand the influence it has for us to borrow money. However, the score fails to measure other important factors that influence how much money we can borrow: cash on hand, savings accounts, equities, retirement funds, etc. These are all factors that define our financial health. However, there is no similar scoring tool to help us measure our financial health. I think a financial health score would be much more relevant for consumers as it is a data point that helps discern where they stand in relation to life’s big financial pressures including qualifying for a loan or understanding how much money they need to retire. Flexscore is a innovative FinTech company that is trying to do just that; provide a service that gives consumers insight into their financial health through one score. Their consumer site is now live and they are touting a base of 30K users.Aside from the challenges, Flexscore has even greater opportunities ahead. The potential big win for Flexscore is their unique ability to build a technology that produces a “score” relevant for consumers, financial planners AND financial institutions. Flexscore recently presented a new solution at FinovateSpring that helps financial planners provide this score to their clients. This is interesting for it gives the advisor and client a unit of measure that they can BOTH understand.Yes, it may be a challenge to get enough advisors to adopt the Flexscore and trust the methodology behind it. I think there is opportunity here for Flexscore to gain traction if financial advisors at banks and lending institutions adopt the scoring. By engaging customers in conversations about their financial health, banks are able to build deeper customer relationships and their pool of potential clients to lend to. Remember banks make their money off mortgage lending. This deeper consumer relationship will also ease the torrid lending process for the bank will have record of the consumers’ financial health and documents on file. Banks will be lending to a known and assessed borrower….insuring a much faster approval process. A faster approval process means a happier customer! I’m envisioning a financial advisor saying, “Mr. Dunstan, if you achieve a Flexscore of 780, you will be qualified for a great mortgage or refi rate of X%. Let’s see what we can do to get there.” Boom. The reason for having a Flexscore is directly relevant for me as a consumer….and I’m now engaged in a relevant conversation with my banker. This conversation becomes a collaboration in which the bank is “selling” me another loan. Another conversation could focus on my retirement planning with my bank’s financial advisor. “Mr. Dunstan, to retire at 65, you need a Flexscore of 950. You are a ways off from 780. 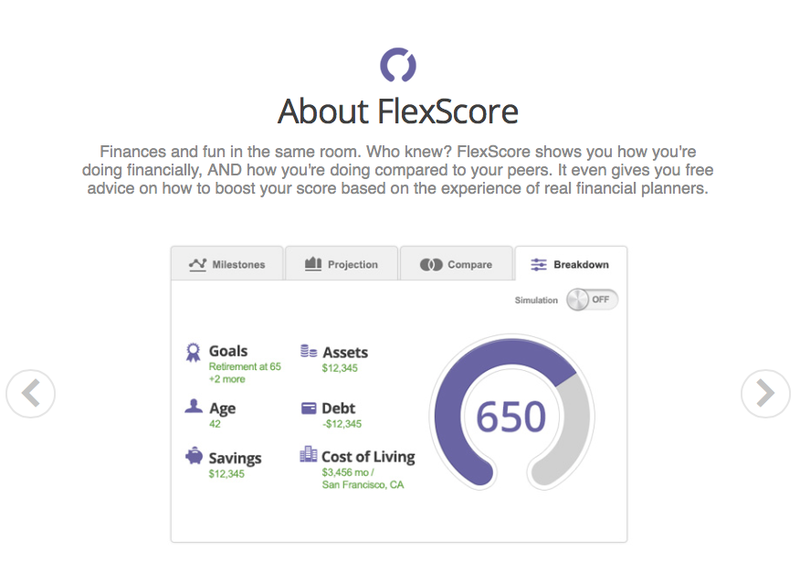 Let’s see how we can get you to your goals.” The Flexscore is now the centerpiece of all future financial planning discussions and compass to the banking products needed to achieve the goals. By enabling banks to make more money off their customers, Flexscore can quickly drive adoption of its more complete financial health scoring method. Banks will pull consumers through the scoring process for it’s relevant for conversations already happening. Consumers are well primed to understand the relevance of this score and may even take action to improve with the right incentives. Hmmm….I can feel another blog post brewing about gamification of this process. However, if Flexscore decides to push this score directly through the consumer channel, building adoption and relevance may prove more costly. As we know, driving consumer awareness and adoption in this noisy world will be expensive for them. Additionally, convincing a typically very tepid consumer to care about their financial health “score” will be challenging too. Remember, consumer adoption rates for personal finance management solutions are typically very low (sub 5%)…which means getting consumers to engage with their money is REALLY HARD. Keep an eye on Flexscore. I think with the right partners and clients Flexscore could redefine how we as consumers evaluate, measure, improve and discuss our financial health…and with so few Americans adequately prepared to retire, these conversations need to be had earlier in life.